”Family tree" is an expression of my desire to create a sculpture which will embrace. People must not be met by a lonely figure at the entrance to the Hospice Djursland. I wanted to emphasise that people are a part of a larger whole, regardless of how alone they may feel, that you are actually a building block, an element in a larger context. Everyone is born out of someone and into a world that is constantly changing. "Imprint Portal”. In the same way as the sculpture on the front relates to arrival, the embrace in the architectonic movement and intimacy of the space, the sculpture on the other side of the building relates to the fantastic view. It is a portal that one can move through physically. 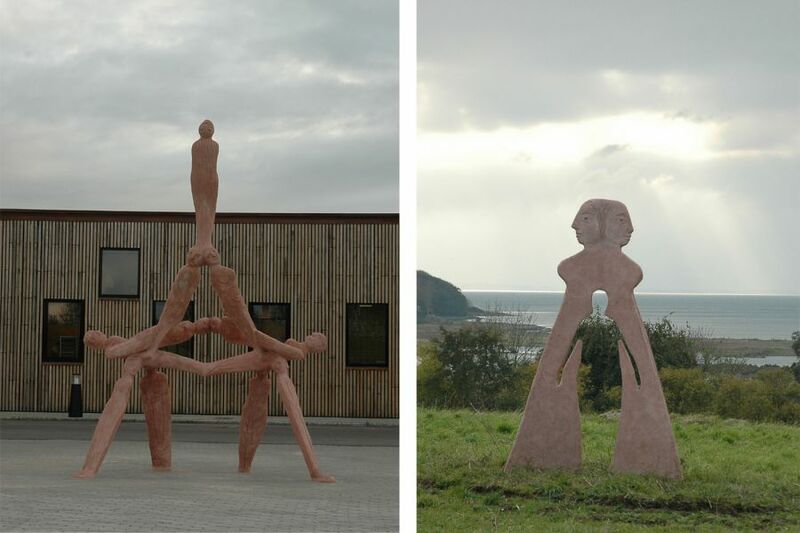 The sculpture can be experienced as a silhouette, with two female figures in profile and the empty space between them as a figure. The memory of - longing and loss, but also the corridor to something else. Hope and uncertainty. "When I see Family Tree, I think: We are here in different places, at different times. But we share the circumstances. So we are basically the same. We have so much in common. We have each others' lives in our hands, we connect together and move each other. I cannot resist touching it. And being moved. And this is basically what life is about -being touched, moved and loved. About the Imprint Portal: They lean up against each other in sun and wind. But now they have turned around and are going in their respective directions. Perhaps they are just on their way out into daily life on an ordinary morning. Perhaps they will never see each other again here on earth. But the imprint of the other is pressed deeply into them. That imprint will never disappear. We see it so clearly. We see their love and their sorrow, which are one and the same. Belonging."